Comet C/2007 N3 (Lulin) made its closest approach to earth on February 24, 2009. This is a color CCD image taken with an SBIG STL-11000M CCD using a Takahashi Epsilon 180ED telescope. This image was taken at the University of Arizona Mount Lemmon SkyCenter. Comet C/2007 N3 (Lulin) on February 7, 2009. This is an RGB color composite CCD image taken with an SBIG ST-8XE CCD using a Takahashi Epsilon 180ED telescope. I have a diagram that shows why this comet appears to have two tails. This image was published in the 2010 Vatican Observatory Calendar. 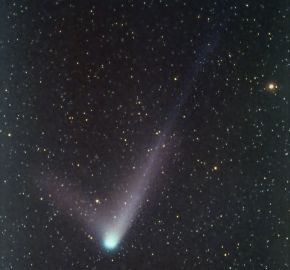 This image was featured in a story published by the St. Louis Beacon entitled, "Comet Lulin Makes a Unique Appearance." This image was also published in the photo gallery on the Anacortes Telescope & Wild Bird website. The image was used to illustrate a story in Ciência Hoje das Crianças, which is a magazine in Brazil that teaches science to children. The image was used by the Maynard F. Jordan Planetarium at the University of Maine. Comet C/2007 N3 (Lulin) Image taken before dawn on the morning of January 27, 2009. This is an RGB color composite CCD image taken with an SBIG ST-8XE CCD using a Takahashi Epsilon 180ED telescope. (January 27, 2009) (165KB) This image was featured in a news story published by MSNBC entitled, "Newfound Comet Lulin to Grace Night Skies." It was also published on the Spaceweather.com website. This image was used in the Google Earth planisphere site, and on the Cosmic Visibility website. This image was also published in the photo gallery for the Anacortes Telescope & Wild Bird website. The image was published in a Night Sky Columnist article on SPACE.com. Comet 17P/Holmes An RGB color composite CCD image taken with an SBIG ST-8XE using a Takahashi FS-78 refractor. (November 25, 2007) (53KB) This image was published on the website for Spaceweather.com. Comet C/2002 T7 (LINEAR) A color composite CCD image taken with a Takahashi FCT-150 refractor. (February 2, 2004) (17KB) This image was published by Astronomy Magazine on their web site.